Place the chicken breasts in the bottom of the stoneware of a slow cooker. In a small bowl or measuring cup, mix together the chicken stock, soy sauce, sesame seed oil, rice wine vinegar, honey, ginger, garlic, and red pepper. Pour over chicken. Add more chicken stock during the cooking if the chicken starts to dry out or burn. Cook on low for 8 to 10 hours. Once cooked, shred the chicken using two forks or your hands. Pour the cooking liquid through a mesh sieve. Stir in 2 tsp of corn starch and pour into a sauce pan. Bring sauce to a simmer and reduce until the sauce has thickened and coats the back of a spoon. About 5 minutes. Place a large pan over high heat. Add in the coconut oil and coat the bottom of the pan. Dump in the cauliflower and stir to coat in the oil and lightly sauté for 1 to 2 minutes. Pour in coconut milk, lime zest, and lime juice. Turn heat to medium, cover pan, and let cook for another 5 to seven minutes, until coconut milk has reduced and cauliflower is tender. Cut pineapple in halve lengthwise. Use a small knife to cut around the inside of the pineapple, leaving a small margin between the outside skin and the interior flesh. Score the flesh to make 4 squares. Use a spoon to scoop out the pineapple creating a well in the center. Pour out any excess juice. Chop pineapple into small pieces. 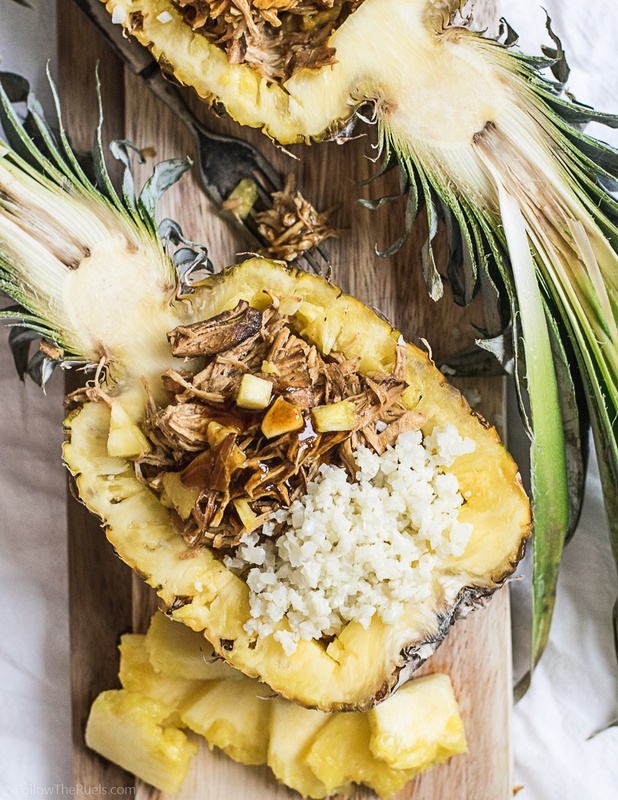 Toss the shredded chicken with some of the sauce and pineapple. To assemble, spoon the coconut rice into half the pineapple and the chicken into the other half. Top with more pineapple.